براهنی, محمد, امینی, سعید. (1396). مطالعه تاثیر پارامترهای ماشین‌کاری بر میزان لایه‌لایه‌شدگی در فرآیند ماشین‌کاری مافوق‌ صوت دوار با ابزار الماسه هسته‌دار بر روی کامپوزیت GFRP. علوم و فناوری کامپوزیت, 4(1), 67-74. محمد براهنی; سعید امینی. "مطالعه تاثیر پارامترهای ماشین‌کاری بر میزان لایه‌لایه‌شدگی در فرآیند ماشین‌کاری مافوق‌ صوت دوار با ابزار الماسه هسته‌دار بر روی کامپوزیت GFRP". علوم و فناوری کامپوزیت, 4, 1, 1396, 67-74. براهنی, محمد, امینی, سعید. (1396). 'مطالعه تاثیر پارامترهای ماشین‌کاری بر میزان لایه‌لایه‌شدگی در فرآیند ماشین‌کاری مافوق‌ صوت دوار با ابزار الماسه هسته‌دار بر روی کامپوزیت GFRP', علوم و فناوری کامپوزیت, 4(1), pp. 67-74. براهنی, محمد, امینی, سعید. مطالعه تاثیر پارامترهای ماشین‌کاری بر میزان لایه‌لایه‌شدگی در فرآیند ماشین‌کاری مافوق‌ صوت دوار با ابزار الماسه هسته‌دار بر روی کامپوزیت GFRP. علوم و فناوری کامپوزیت, 1396; 4(1): 67-74. کامپوزیت‌های تقویت‌شده با الیاف شیشه به‌علت خواص مکانیکی و فیزیکی مناسب آن‌ها دارای کاربردهای صنعتی متعددی هستند. سوراخ‌کاری از جمله روش‌های رایج برای ایجاد اتصال بین سازه‌های از جنس مواد تقویت­شده با الیاف می‌باشد. فرآیند ماشین‌کاری مافوق‌صوت دوار از روش‌های نوین در ماشین‌کاری کامپوزیت‌های تقویت­شده با الیاف می­باشد که در سال‌های اخیر بسیار مورد توجه قرار گرفته است. لایه­های کامپوزیت‌های تقویت­شده با الیاف در عملیات ماشین‌کاری مخصوصاً در عملیات سوراخ‌کاری که در معرض تمرکز تنش قرار می‌گیرند، دچار آسیب لایه­لایه­شدگی می‌شوند. پدیده لایه­لایه­شدگی به‌شدت تحت تاثیر عواملی مانند جنس و هندسه ابزار و همچنین پارامترهای ماشین‌کاری قرار دارد. از این رو در سال‌های اخیر از ابزارهای جدید مانند ابزار الماسه هسته­دار با توجه به کاهش نیرو و انجام هم‌زمان عملیات سوراخ‌کاری و سنگ‌زنی داخل سوراخ، در سوراخ‌کاری کامپوزیت‌های تقویت شده با الیاف، استفاده می­کنند. در این پژوهش به بررسی میزان لایه­لایه­شدگی در کامپوزیت تقویت­شده با الیاف شیشه (GFRP) با درصد الیاف 65% در فرآیند ماشین‌کاری مافوق ‌صوت دوار با ابزار الماسه هسته­دار، با توجه به پارامترهای ماشین‌کاری پرداخته شده است. با توجه به آزمایشات انجام‌شده مشاهده شد افزایش سرعت برشی و کاهش سرعت پیش‌روی موجب کاهش آسیب لایه­لایه­شدگی شده و کیفیت سوراخ را بهبود می­بخشد. همچنین با توجه به نتایج به‌دست­آمده، در نرم افزار مینی­تب، یک رابطه آماری بین پارامترهای ماشین‌کاری و لایه‌لایه‌شدگی ارائه شد. با توجه به مدل به‌دست­آمده، سرعت برشی تاثیر بیشتری بر میزان لایه­لایه­شدگی دارد. Davim, J.P. Campos Rubio, J. and Abrao, A.M., "A Novel Approach Based On Digital Image Analysis To Evaluate The Delamination Factor After Drilling Composite Laminates," Composites Science and Technology, Vol. 67, pp. 1939-1945, 2007. Nagarajan, V.A. Sundaram, S. and Rajadurai, J.S., "A Novel Approach Based On Digital Image Analysis To Evaluate Refined Delamination Factor For E-Glass 21xk43 Gevetex/LY556/DY063 Epoxy Composite Laminates," Engineering Manufacture, Vol. 225, Part B, pp. 1977-1982, 2011. König, W. Wulf, C. Grass, P. and Willerscheid, H., "Machining Of Fiber Reinforced Plastics," Ann CIRP, Vol. 34, No. 2, pp. 536–548, 1985. Pei, Z.J. Khanna, N. Ferreira, P.M., "Rotary Ultrasonic Machining of Structural Ceramics-A Review," Ceram Eng Sci Proc, Vol. 16, No. 1, pp. 259-78, 1995. Hocheng, H. and Tsao, C.C., "Effects Of Special Drill Bits On Drilling-Induced Delamination Of Composite Materials," International Journal of Machine Tools & Manufacture, Vol. 46, pp. 1403-1416, 2006. König, W. Grass, P. Heintze, A. Okcu, F. and Schmitz-Justin, C., "Developments In Drilling And Contouring Composites Containing Kevlar," Production Engineer, Vol. 63, No. 8, pp. 56-61, 1984. Hocheng, H. and Puw, H., "On Drilling Characteristics Of Fibre-Reinforced Thermoset And Thermoplastics," Int J Mach Tools Manufact, Vol. 32, No. 4, pp. 583-92, 1992. Hocheng, H. Puw, H. and Yao, K., "Experimental Aspects Of Drilling Of Some Fibre Reinforced Plastics," Proceedings Of The Machining Of Composite Materials Symposium, Chicago, Illinois, ASM Materials Week, pp. 127–38, 1992. De Albuquerque, V.H.C. Tavares, J.M.R.S. and Durão, L.M.P., "Evaluation Of Delamination Damage On Composite Plates Using An Artificial Neural Network For The Radiographic Image Analysis," Journal of Composite Materials, Vol. 44, No. 9, pp. 1139-1159, 2010. Persson, E. Eriksson, I. and Zackrisson, L., "Effects Of Hole Machining Defects On Strength And Fatigue Life Of Composite Laminates," Composites Part A: Applied Science and Manufacturing, Vol. 28, No. 2, pp. 141–151, 1997. El-Sonbaty, I. Khashaba, U.A. and Machaly, T., "Factors Affecting The Machinability Of GFR/Epoxy Composites," Composite Structures, Vol. 63, No. 3–4, pp. 329–338, 2004. Chen, W., "Some Experimental Investigations In The Drilling Of Carbon Fibre-Reinforced Plastic (CFRP) Composite Laminates," Int J Mach Tools Manufact, Vol. 37, No. 8, pp. 1097–108, 1997. Hocheng, H., "Machining Technology for Composite Materials," First ed., Woodhead Publishing, Cambridge, pp. 333-364, 2011. Arola, D. Ramulu, M. and Wang, D.H., "Chip Formation In Orthogonal Trimming Of Graphite/Epoxy Composite," Composite Part A, Vol. 27, pp. 121-133, 1996. Davim, J.P. and Reis, P. and Conceicao Antonio, C., "A study on milling of glass fiber reinforced plastics manufactured by hand-lay up using statistical analysis (ANOVA)," Composite Structures, Vol. 64, pp. 493–500, 2004. Lopez de lacalle, L. N. and Lamikiz, A. and Campa, F.J. and Valdivielso, A. F.D.Z., "Design and Test of a Multitooth Tool for CFRP Milling," Journal of Composite Materials, Vol. 43, pp. 3275-3290, 2009. Yuan, S. Zhang, C. Amin, M. Fan, H. and Liu, M., "Development Of A Cutting Force Prediction Model Based On Brittle Fracture For Carbon Fiber Reinforced Polymers For Rotary Ultrasonic Drilling," The International Journal of Advanced Manufacturing Technology, Vol. 81, pp. 1223-1231, 2015. Campos Rubio, J. Abrao, A.M. Faria, P.E. Esteves Correia, A. and Davim, J.P., "Effects Of High Speed In The Drilling Of Glass Fibre Reinforced Plastic: Evaluation Of The Delamination Factor," International Journal of Machine Tools & Manufacture, Vol. 48, pp. 715-720, 2008. Kumabe, J., "Fundamentals and Application of Vibration Cutting," Jikkyo Publishing, Japan, 1979. Azarhoushang, B. and Akbari, J., "Ultrasonic-Assisted Drilling of Inconel 738-LC," International Journal of Machine Tools & Manufacture, Vol. 47, pp. 1027-1033, 2007. Takeyama, H. and Kato, S., "Burrless Drilling By Means Of Ultrasonic Vibration," Annals of CIRP, Vol. 40, No. 1, pp. 83-86, 1991. Zhang, D.Y. Feng, X. J. Wang, L.J. and Chen, D.C., "Study On The Drill Skidding Motion In Ultrasonic Vibration Microdrilling," International Journal of Machine Tools and Manufacture, Vol. 34, No. 6, pp. 847-857, 1994. Zhang, D.Y. and Wang, L.J., "Investigation Of Chip In Vibration Drilling," International Journal of Machine Tools and Manufacture, Vol. 38, No. 3, pp. 165-176, 1998. Zhang, L.B. Wang, L.J. and Wang, X., "Study On Vibration Drilling Of Fiber Reinforced Plastics With Hybrid Variation Parameters Method," Composites: Part A, Vol. 34, pp. 237-244, 2003. Arul, S. Vijayaraghavan, L. Malhotra, S.K. and Krishnamurthy, R., "The Effect Of Vibratory Drilling On Hole Quality In Polymeric Composites," International Journal of Machine Tools & Manufacture, Vol. 46, pp. 252-259, 2006. Debnath, K. Singh, I. and Dvivedi, A., "Rotary Mode Ultrasonic Drilling Of Glass Fiber-Reinforced Epoxy Laminates," Journal Of Composite Materials, Vol. 49, No. 8, pp. 949-963, 2014. Bertsche, E. Ehmann, K. and Malukhin, K., "An Analytical Model Of Rotary Ultrasonic Milling," Int J Adv Manuf Technol, Vol. 65, Pp. 1705-1720, 2013. Uhlmann, E. and Spur, G., "Surface Formation In Creep Feed Grinding Of Advanced Ceramics With And Without Ultrasonic Assistance," CIRP Ann Manuf Technol, Vol. 47, No. 1, pp. 249-252, 1998. Li, Z.C. Jiao, Y. Deines, T.W. Pei, Z.J. and Treadwell, C., "Rotary Ultrasonic Machining Of Ceramic Matrix Composites: Feasibility Study And Designed Experiments," Int J Mach Tool Manuf, Vol. 45, Pp. 1402-1411, 2005. Standard Test Method For Tensile Properties Of Polymer Matrix Composite Materials, Annual Book Of ASTM Standard, 08.01, D 3039M-95a, 1997. Torabizadeh, M.A., "Tensile, Compressive And Shear Properties Of Uni-Directional Glass/Epoxy Composites Subjected To Mechanical Loading And Low Temperature Services," Indian Journal Of Engineering Material Science, Vol. 20, Pp. 299-309, 2013. Tsao, C.C. And Hocheng, H., "Evaluation Of Thrust Force And Surface Roughness In Drilling Composite Material Using Taguchi Analysis And Neural Network," Journal Of Material Processing Technology, Vol. 203, pp. 342-348, 2008. Feito, N. Díaz-Álvarez, J. Díaz-Álvarez, A. Luis Cantero, J. and Henar Miguélez, M., "Experimental Analysis Of The Influence Of Drill Point Angle And Wear On The Drilling Of Woven Cfrps," Materials, Vol. 7, pp. 4258-4271, 2014. Liu, J. Zhang, D. Qin, L. and Yan, L., "Feasibility Study Of The Rotary Ultrasonic Elliptical Machining Of Carbon Fiber Reinforced Plastics (CFRP), " International Journal Of Machine Tools & Manufacture, Vol. 53, pp. 141-150, 2012. Hocheng, H. and Tsao, C.C., "The Path Towards Delamination-Free Drilling Of Composite Materials," Journal Of Material Processing Technology, Vol. 167, pp. 251–264, 2005. Wang, H. Sun, J. Li, J. and Li, W., "Investigation On Delamination Morphology During Drilling Composite Laminates," The International Journal Of Advanced Manufacturing Technology, Vol. 74, No. 1, pp. 257-266, 2014. Sheikh-Ahmad, J.Y., "Machining Of Polymer Composites," First ed., Springer, New York, USA, Pp. 197-201, 2009. Davim, J.P., and Reis, P., "Drilling Carbon Fiber Reinforced Plastics Manufactured By Autoclave–Experimental And Statistical Study," Materials And Design, Vol. 24, pp. 315-324, 2003. Khashaba, U.A., "Delamination In Drilling GFR-Thermoset Composites," Composite Structures, Vol. 63, Pp. 313-327, 2004. Tsao, C.C. and Hocheng, H., "Taguchi Analysis Of Delamination Associated With Various Drill Bits In Drilling Of Composite Material," International Journal Of Machine Tool And Manufacture, Vol. 44, pp. 1085–1090, 2004. Davim, J.P. and Reis, P., "Study Of Delamination In Drilling Carbon Fiber Reinforced Plastics (CFRP) Using Design Experiments," Composite Structures, Vol. 59, pp. 481-487, 2003. Hakimi, E. and Amini, S., "Study Of Delamination In The Process Helical Milling Of Carbon Fiber-Reinforced Polymer Composite," In Persian, Journal Of Science And Technology Of Composites, Vol. 2, No. 4, pp. 51-58, 2016. Razfar, M.R., "Machining and Tool Principles," In Persian, First ed., Amirkabir University, Tehran, Iran, pp. 185-205, 2011. Amini, S. Barani, A.R. and Paktinat, H., "Machining and Cutting Tools," In Persian, First Ed., Kashan University, Kashan, pp 25-44, 2013. 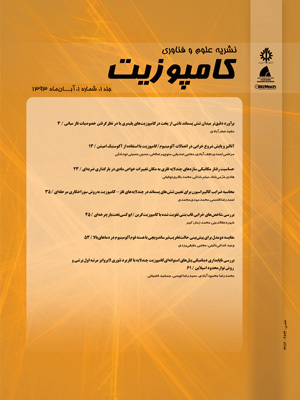 Bayazidi, E. Oladi, B. Abbasi, N. and Afaridoun, K., "Statistical Analysis with Minitab 16," First Ed., Aabed, Tehran, Iran, pp. 123-142, 2012.